Pressure is building on Facebook and other social media platforms to stop hosting extremist propaganda including terrorist events, after last Friday's deadly attacks on two mosques in New Zealand were live-streamed. Australia's prime minister has urged the G20 to use a meeting in June to discuss a crackdown, while New Zealand media reported the nation's biggest banks have pulled their advertising from Facebook and Google. "We cannot simply sit back and accept that these platforms just exist and what is said is not the responsibility of the place where they are published," New Zealand Prime Minister Jacinda Ardern told parliament yesterday. "They are the publisher, not just the postman. There cannot be a case of all profit, no responsibility." Facebook said it had been working directly with New Zealand police and across the technology industry to "help counter hate speech and the threat of terrorism". The lone shooter accused of killing 50 people in the New Zealand city of Christchurch live-streamed the murders, with the video continuing to be widely available on a range of platforms hours after the attack. The suspect, an Australian, uploaded his hate-filled manifesto online shortly before launching his assault. It's the latest example of social media companies struggling to keep offensive content from sites that generate billions of dollars in revenue from advertisers - a problem that's seen Facebook founder Mark Zuckerberg grilled by US Congress. The shooting video was viewed fewer than 200 times during its live broadcast, and no users reported the video during that time, Facebook vice-president and deputy general counsel Chris Sonderby said in a blog post. It was reported to the company 29 minutes after the video started and viewed 4,000 times before being removed, he said. The G20 should discuss the issue at its Osaka summit in June, Australian Prime Minister Scott Morrison said yesterday in an open letter to this year's host, Japan counterpart Shinzo Abe. The group should work to ensure technology firms implement appropriate filtering and remove terrorist-linked content, and show transparency in meeting those requirements, he said. "It is unacceptable to treat the internet as an ungoverned space," Mr Morrison said. Ms Ardern's government will look at the role social media played and what steps it can take, including on the international stage. Previously she vowed to seek talks with Facebook, which said it blocked the upload of 1.2 million video clips and removed another 300,000 within 24 hours. 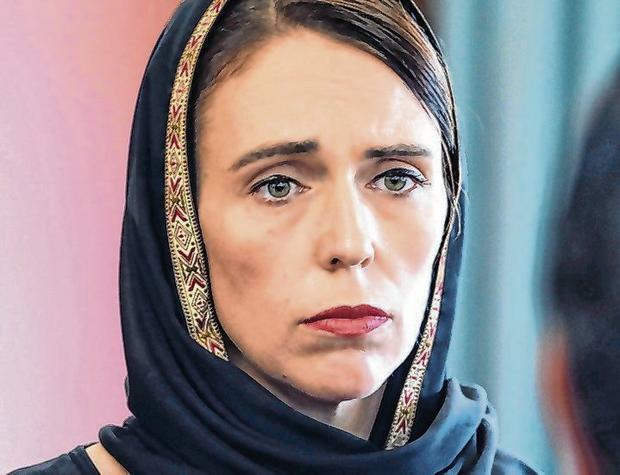 Ms Ardern yesterday also vowed never to refer to the Christchurch mosque attacker by his name, as she said he would face "the full force of the law". But Ms Ardern said she wanted to ensure that the killer did not enjoy any publicity as a result of the shooting and that attention should instead focus on his victims. She also implored others "to speak the names of those who are lost, rather than the name of the man who took them". Relatives of the victims say they have been overwhelmed by support from New Zealanders, who have flocked to vigils in Christchurch following Friday's attack. Janna Ezat, whose son Hussein died as he charged at Tarrant in an attempt to save lives, said he was wearing white instead of mourning black because he was so proud of him. Meanwhile, Tayyip Recep Erdogan, the Turkish president, called on New Zealand to reinstate the death penalty in response to the massacre. Mr Erdogan has faced criticism for using footage of the shootings and extracts from Tarrant's manifesto to drum up domestic support among Muslim voters.